Written in an easy-reading, light-hearted style, Love You More is a wonderfully inspiring read! Much more than a story of one family’s journey through international adoption. Love You More is the Grant Family’s story. Adoption just happens to be a part of that story. Jennifer Grant and her husband, David, are parents to four children. Jennifer gave birth to three of their children. Their fourth child, Mia, was born in Guatemala and came into their family through international adoption. Grant relays the ups and downs of their adoption journey, as well as ups and downs of their marriage and family through the years. Though she unmistakably portrays the love she has for her daughter Mia, Grant does not shy away from telling the difficult parts of her story. As a mother myself of all adopted children, I know firsthand how rewarding, emotional and difficult the process can be all at the same time. Grant’s story is a realistic portrayal of the international adoption process. 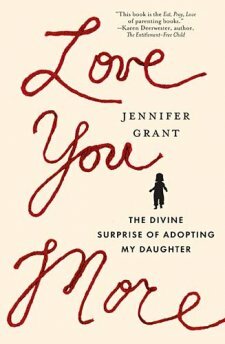 It is a story I wish I could have read while going through the adoption process myself. It is a story I thoroughly enjoyed reading now. It is a story I recommend to anyone.